The Director of the Dallas Council on American Islamic Relations (CAIR), Mustafa Carroll, made an eye-opening statement in 2015 in Austin, Texas at a rally. He was currently doing battle with Irving, Texas Mayor Beth Van Duyne who has accused mosque leaders of creating separate laws for Muslims. Carroll believes that Shariah law supersedes constitutional or American laws. 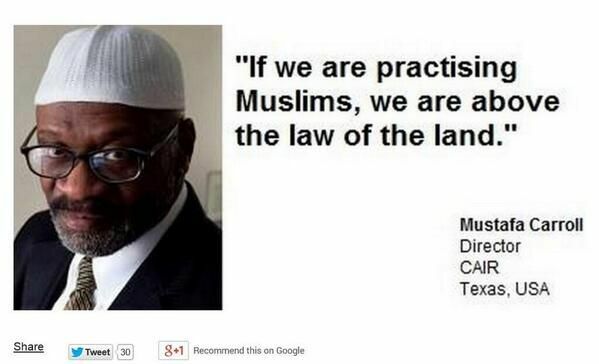 If you are a practicing Muslim, you are above our laws… period according to CAIR. The Quran is their law and they do not assimilate or recognize our legal system. CAIR is the nation’s largest Muslim civil liberties and advocacy organization. They are headquartered in DC and are tied to the Muslim Brotherhood. That’s a terrorist organization that Obama refuses to label as such and he has gone to great lengths to bring them into the White House and into positions of power in our government. CAIR spins a positive image of Islam at every opportunity… they never mention the likes of ISIS who crucify, torture, behead and enslave Christians and others everywhere they go. That is the true face of Islam and CAIR. The Director of the Dallas Council on American Islamic Relations (CAIR), Mustafa Carroll, made a surprising and shocking statement during a Muslim rally in Austin, Texas. He firmly believes that the message of the Qur’an is supreme over the United States constitution. The statement would be shocking to most citizens of the United States, unless they had some perspective on who CAIR really is. CAIR itself is a terrorist organization as far as I’m concerned. They feel that now that Obama has put Muslims in the US government, that by default we are now a Muslim nation and should be forced to bow to Allah. Not. Going. To. Happen. Ever. 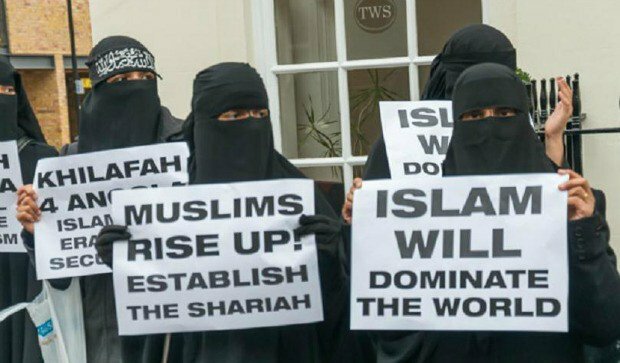 Islam joins a long line of uber evil movements and individuals that have felt they are above the rule of law… ISIS, Nazis, communists, despots and globalists. You have people like Hillary Clinton who flagrantly flaunts having to answer to our laws. Barack Obama is another such person. When the rule of law dies, that is when you see revolutions rise. Whether it be an Imam, Muslim, dictator, communist or a political tyrant like Clinton or Obama… one thing is certain… actions have consequences and they might do well to take a gander at history. Perhaps look at Maximilien François Marie Isidore de Robespierre who was a French lawyer and a politician. He was one of the best-known and most influential figures of the French Revolution, the defense of the Republic and the Reign of Terror. He also lost his head as did Marie Antoinette, Louis XVI and others. Looks like Muslims aren’t the only ones that behead. I’d rather not see that happen here in the US. Just sayin’.